The key to product development success is an organized and timely communication between designers and their teams, factories and suppliers. On an average, a designer at least have 7-8 styles per season. 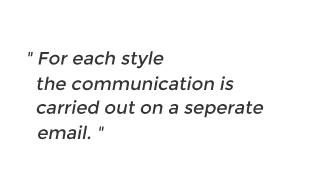 This means that for each style the communication is carried out on a separate email thread. And each thread includes the comments, clarifications, file attachments and other important information from everyone in the supply chain. Managing all this different set of conversations tends to become tedious and time-consuming. And also frustrating if one has to digg-in deep in those emails to find a very important comment or file. 1) Now you don't have to dig deep inside those long email chains to find any important information. 2) You don't have to switch-in between your email clients and desktop folders to organize your style information. 3) All your style comments and files can be Sent, Received and Searched right through your Techpacker account. You can send comments or even files (including PSD, AI and CAD), right from your tech packs cards to as many collaborators. To get the attention of any tech pack shared member, start typing "@" and you'll get suggestions. Save the card and it will automatically generate a notification for them. Look for the notification inbox (a bell icon) located on the left side action panel of your screen. Here you can keep track of your entire comments histories, mentions from all your collaborators. You can also activate desktop notifications if you wish to receive real-time alerts. Besides you will be anyway forwarded a notification email with the comments directly in your registered email account. If you're on the go, you can simply reply back to that email and your comments will be automatically registered in the cards comments area. This is how we insure your communication history is efficiently organized. From your notification inbox you can also filter down and search any previous comment based on the tech pack name, card title, the date it was received or even by a team-member's name.